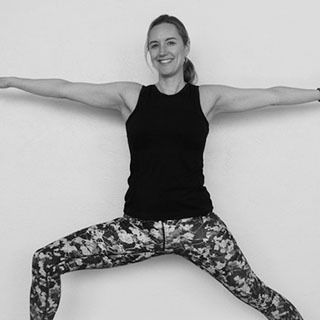 I intermittently attended yoga classes for many years, but it wasn’t until I discovered power vinyasa in 2016 that I truly committed to the practice. The breath, movement and sweat was the recipe I needed to quiet my mind and discover an inner stillness I had never felt before. On a whim I enrolled in yogaRIOT’s teacher training program in 2018. My practice deepened and my love for teaching expanded. My goal is for every person who takes my class to feel seen, cared for, and challenged in the space we share. I believe this dynamic, life affirming practice can fit anyone who seeks it; helping facilitate that discovery is such a joy. 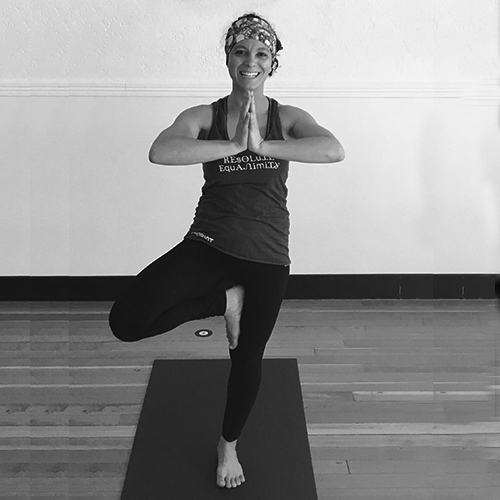 I love exploring different styles of yoga and incorporating them into my home and studio practice and into the classes I lead. I have had so many wonderful teachers show me that every time I get on my mat it’s a new opportunity for reflection, perspective and growth. That stays with me when I’m walking my little terrier Magpie, tending to my indoor garden or working on one of my many unfinished creative projects. I can thank one of my oldest friends for my introduction to yoga. Friend + Groupon = 2013 first practice. I was enthralled and haven’t stopped since. My practice and teaching are inspired by humor, strength, persistent tenacity and connection. The opportunity to explore teaching came at a time of transition. I was going to tackle something and had to choose between something with which I was familiar and something entirely new. Many, many hours of training later I can thank the experience for deepening my yoga practice and improving how I communicate, both inside and outside of the studio. I enjoy learning from every yogaRIOT instructor. I’m trying everyday to be a better person and leader and I’m grateful for the opportunity grow along with the yogaRIOT community! I began a daily hot yoga practice in 2000 in response to my body breaking. It was the last thing I could do that didn’t hurt. I had always been an athlete and I needed to move, but running, dance, cycling and a lifetime of hard driving had taken a toll on my joints. In my yoga journey I learned how to take care of myself, physically, emotionally, spiritually. I trained with Karen Abbott, Bikram Choudhury, Baron Baptiste and many other gifted yoga teachers around the world. I am an intuitive and present teacher. I get a kick out of inviting you to play and explore your EDGE on your yoga mat. I believe in yoga as a path to health and wellness and as a tool for presence and authenticity. My Teacher/Leader Stake is to hold space for you to step up to your edge and grow into your yoga practice in Big Bold ways. I invite you to come and find yourself on your mat. I was 31 when i tried yoga for the first time. It was a Power Yoga class. Fifteen minutes in, I wondered why the hell I let someone talk me into going. However, I felt so good afterwards that I started going regularly. I was living in Central Florida at the time and I will always be grateful to my first yoga teacher for blending challenge with the mindfulness of safety. I had no idea at the time that I was at the very beginning of my journey towards becoming a fitness professional. Fast forward seven years and I graduated Yoga Teacher Training through yogaRIOT in June 2018. After working in the fitness realm for six years, my body was getting depleted from too much high intensity exercise. 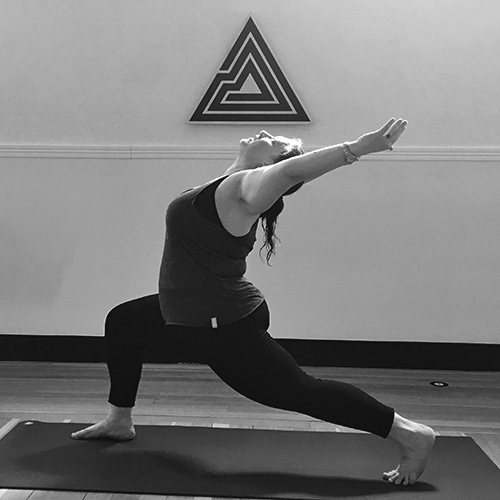 In seeking a fitness format that would allow me to instruct without wearing out my body, I also changed my own life through finding a consistent yoga practice. My most influential teachers have been Jen King (my very first yoga teacher) and of course Annie and Kari. Annie and Kari are dedicated teachers and yogis. I am forever grateful that I found yogaRIOT and went through my teacher training here. I am regularly inspired by the revelations I have every time I step onto my mat and practice. Sometimes, I come away with something completely different than what I was seeking. There is always something new, some way to grow. When I am not at the studio, I am doing my best to make a positive contribution to the world, riding my bike, spending time with my soul family (pets included), dancing and creating. 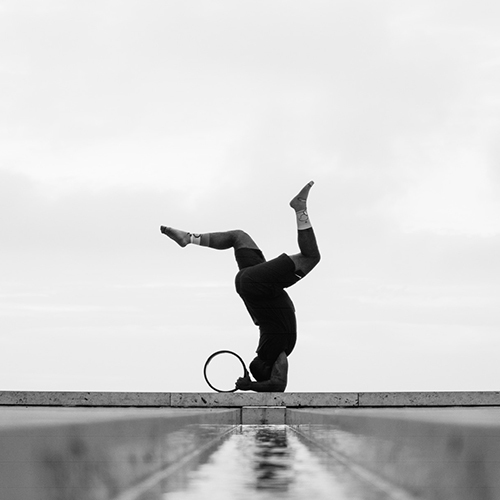 I have always been in love with the art of movement. I was introduced to yoga in college. I received my first yoga teacher certification and fell in love with the beautiful ways the body and mind powerfully move together. Since then I have completed and assisted many teacher trainings, Power Vinyasa, and Prana Flow. I believe that everyone has something to teach us. I will continue to crave knowledge and experience to enhance my practice and empower others in theirs. I became a teacher because yoga transformed my life. That vibrant energy needs to be shared with everyone! I believe in creating a loving, open space where students will be challenged while having fun. I celebrate knowing that I help people discover strength, flexibility, and the opportunity to grow. I started practicing yoga when I was 17 and in my early 30’s when I began a regular practice. I was in the midst of completing a big project when I finally understood that mind and body go hand to hand. The need for yoga came natural to create balance in my life. I started teaching yoga a couple years ago. I was craving voices that spoke of and understood the challenges of life through the perspective of diverse experiences. Teaching yoga gives me the opportunity to state that yoga IS for every body. My best yoga teachers are children. From them, I learn the joy of being alive, the lightness of a lack of self-consciousness, and the fun of exploring the limits of the body. My practice and teaching are inspired by the opportunity to reclaim our bodies, reclaim our lives every single moment. Past and future are consequences of the present moment, and the gift of staying present is to regain one’s life back. I began my practice in February of 2015 on a doctor’s recommendation after I was hit with some pretty serious back spasms. I had also been recently diagnosed with depression and my doctor said I should learn to manage stress better and suggested yoga. I ended up on my mat for the first time at Dancing Dogs Yoga in my home town of Greensboro, NC. While walking into the studio that first time, some unexpected snow flurries turned into an unexpected snowstorm. Looking back, that experience struck me. In literature snow can represent death and rebirth. As dramatic as it sounds, I realized that it was that exact day I got a new lease on life. After a few weeks I noticed the physical and emotional weight was coming off and suddenly I was hopeful about the future for the first time in years. After 6 months I said, “If I still love this in a year then maybe I’ll look into teaching.” Soon after, teacher training dates for 2016 were announced and began at my one year anniversary. My grandfather always told me to “Do what’s indicated,” so I accepted that I was going to sign up. Now, I am inspired to teach my students. ESPECIALLY, the new students who are leaving their comfort zone and may not feel confident or out of place, like I did my first day. I’m inspired to see people grow and grateful to be with them during their journey to become the best versions of themselves. My name is Jerrelle Wilson but I also go by Jerreal Flow. This name is symbol of not only how I teach but also how I live my life. I find it imperative to teach students the real things about yoga. As I teach students about alignment, breath and postures I also teach them about the flow of life inside and outside of class. As a black man who was raised playing football, running track and doing everything besides dynamic stretching, it surprised it me how much I loved yoga. 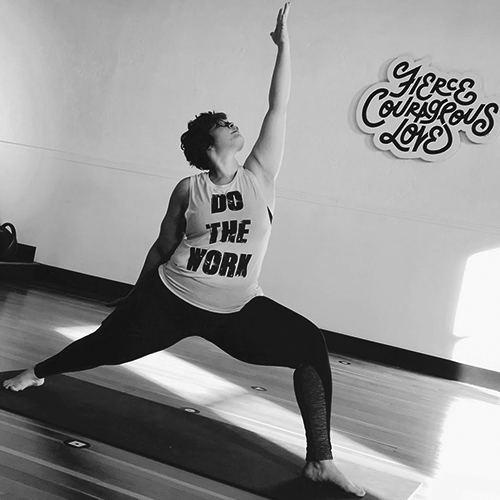 Yoga has given me the opportunity to showcase that you can break the mold with consistency and dedication. I want to share the opportunity with the world. I finished my first teacher training in 2015 at I AM YOGA Wellness in Turlock CA. It was here that I learned about hatha, vinyasa, restorative techniques and how in-depth yoga can be. I would soon move to San Diego and begin truly learning how to teach. In 2018 I had the opportunity to do a 300 hr teacher training in Bali, Indonesia. This training was immersive and taught me more about the subtleties of teaching and the differences between yoga and building a foundation on mobility and strength. Combining all of these trainings over the years has given me a unique perspective on how to teach and apply it individually to each student. Thank you for allowing me to create a space for you to grow and connect with your breath, body and mind. At my peak weight, I hit 330 pounds. I decided I absolutely needed to change my life, I wasn’t happy. I knew that discovering physical exercise was important, but I struggled deeply with wanting to move. Most of my life I had been tortured by mean gym teachers. I carried huge amounts of body shame. I tried yoga so many times throughout my early twenties and mostly walked out of more yoga classes than I stayed to take. 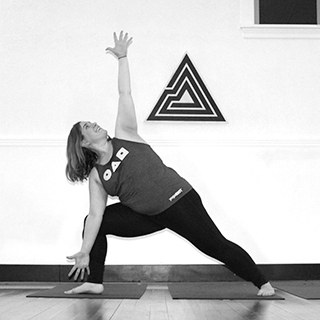 It wasn’t until I came to yogaRIOT that I found a home in yoga and with movement in general. Yoga became a form of movement that I could do everyday. It never gets boring, and there is always room for growth and expansion. Practicing yoga has helped to retell the story of my body. Yoga has changed my body and has sharpened my mind. It is my preference to practice in a heated room. Building fire in my body allows me to move with more ease. I teach because it takes my practice to a new level. 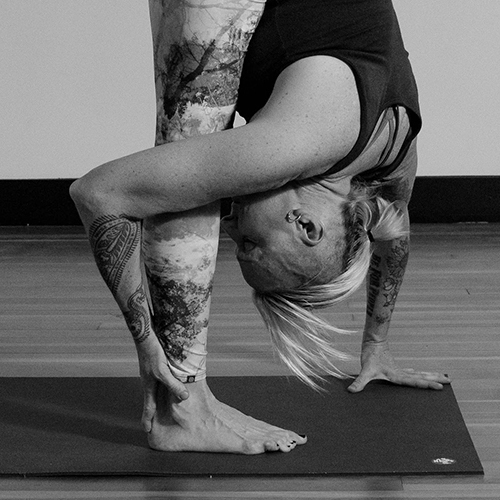 When I teach, I am learning to explore the poses in other people’s bodies as well as my own. 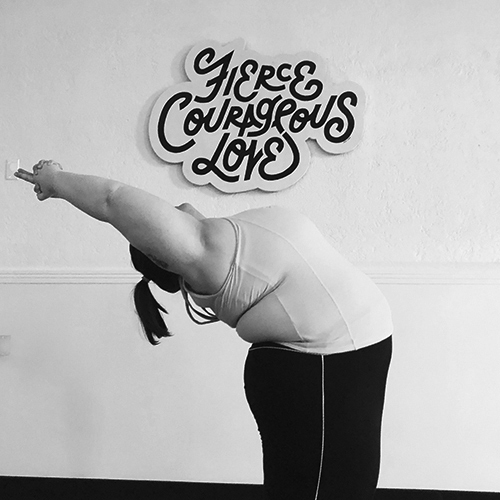 Teaching has empowered me to reach out to people who also struggle with their bodies. I learned to teach from Annie Ory at yogaRIOT. My teaching has been influenced by Baron Baptiste and his method of Baptiste Power Vinyasa Yoga. Also, every single teacher at yogaRIOT has influenced my practice and understanding of yoga. I am inspired when my students come to yoga to experience their bodies as they are. Also, being willing to do hard work and bearing witness to people changing themselves inside and out. Aside from teaching yoga, I am a professional chef. I like to cook for large groups and teach individuals how to nourish themselves. I began practicing yoga when I was 22 in 2002. I was working on my Master of Science in Teaching Music, which was pretty stressful, and intense. My daily bike ride took me by a yoga studio, and I thought, “yoga is silly, who even likes it?” My bike stopped, & locked itself up. I wandered in, and the teacher said, “Oh! You’re right on time for Hatha Yoga. You can practice in what you’re wearing. Enjoy!”. I had just left a lifestyle that had me touring/traveling for 10+ years. I had a yoga practice before, and had injured myself to the point of thinking I’d walk with a cane for the rest of my life. I thought no one would train me to teach, or acknowledge some of the injuries and chronic pain I was living with at the time. 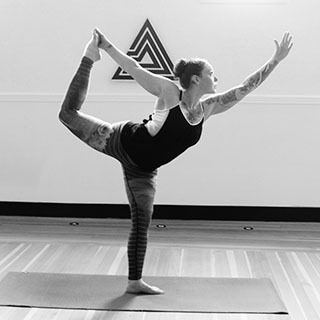 Annie O. at yogaRIOT welcomed me in to training, and I’ve continued to learn from other teachers, and students alike. So far, I’ve learned from talented teachers in many disciplines, and studios around the US, a fun bonus of traveling. I’ve also completed a Yin Yoga training with Ida Riply, which changed my own perception of how alignment shifts pain in my body. I am inspired to teach and practice through the notion that pain will rescind, no one is “stuck” forever, and a little bit of practice every day is good. No one is disqualified from enjoying yoga because of the body they have. Breathe in acceptance, exhale expectations. Aside from yoga, I love tending my garden, playing music around town, and sleeping. I first started practicing yoga 15 years ago when I was pregnant with my first daughter, Anamae. I found the movement, mindfulness and connection to breath to be really helpful in calming my fears and strengthening my inner guidance/intuition. As a result, I was able to have a completely natural childbirth at home, and offer my baby a calm, balanced and strong mama! I received my 200 hour certification in Classical Yoga in 2009, and a 300 hour training in Yoga Therapy in 2014, both from from Ananda Seva Mission in Santa Rosa, CA. Meanwhile, I began to practice with a local Baptiste inspired studio and later began teaching at a Baptiste affiliate studio. I will always appreciate the foundation I received through my initial training, however, I fell in love with the methodology, inquiry and meditation practices and teachers of Baptiste yoga. Most notably, Lisa Ellisen, Leah Cullis, Baron Baptiste and Paige Elenson. I have completed Baptiste Level 1 & 2, and will soon be certified as a tier 1 Baptiste Yoga Leader. My purpose as a teacher is to inspire students to cultivate presence and activate personal power, thereby empowering them to unlock their strength and potential both on and off the mat. My genuine hope is to share my path with others and guide students to live a life of freedom, ease and unlimited possibility! I first came to power vinyasa yoga in November 2015. It quickly became an organizing force in my life and I jumped into teacher training here at yogaRIOT. As a person with disabling chronic migraines, I have a strong relationship with my body. Yoga gives me something joyful and affirming to do with my body rather than just survive. My teachers have met me where I am and teach to my possibilities, not my limitations. By becoming a yoga teacher, I hope to pass that amazing gift on to others. On my best days, my yoga is a meditation with myself about what more I can do and how much ease I can bring to it. Thirty years ago, I read a book by actress and spiritual adventurer Shirley MacLaine and decided to teach myself to meditate. From that auspicious beginning, I have practiced and studied with a variety of teachers including Hindu and Yogic scholars, specialized training in my own earth-based spiritual tradition and the silent retreats offered by the Zen tradition. Through it all, I continue to return to my breath, cultivating a practice of stillness, acceptance and compassion. 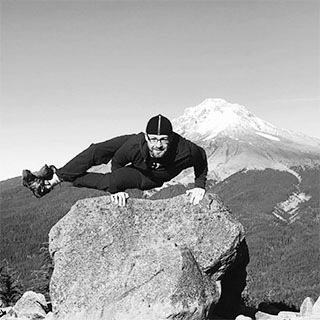 Learn more about yogaRIOT’s teacher trainings.